For this year's Lent installation, on Ash Wednesday we planted some willow branches in earth. Over the course of Lent they have been gradually coming into leaf, reminding us that Lent is a chance for new life for all of us. 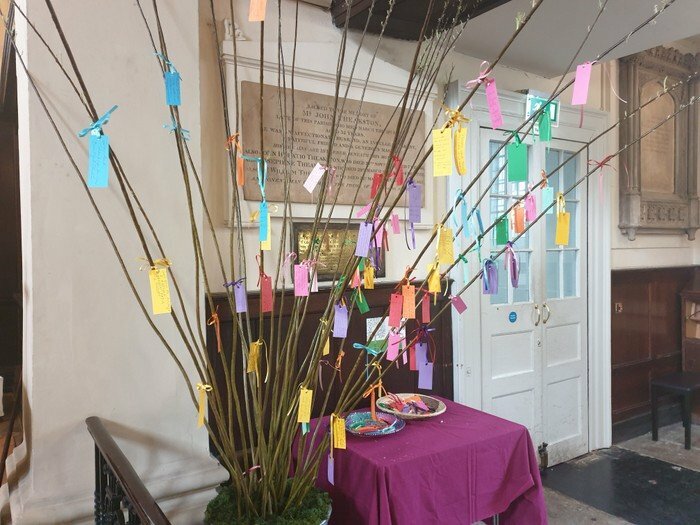 Why not come in and add your prayer to the branches? Download the readings for all 40 days. See below for recent study notes, or look at past days notes. The Book of the Prophet Malachi is the last book of the Old Testament. It was written in that period after the return from exile in Babylon of the people of Israel. In many ways this was a time of profound disappointment. Those who believed fervently in God were disappointed probably in two ways. First because in spite of having rescued them from Babylon as he promised, the reality is that the people of Israel were as weak as ever and constantly at the mercy of more powerful neighbours – as we know by the time of Jesus, the Roman Empire had become the latest of many regional powers to dominate their lives. But second because in spite of God’s faithfulness to them, the people of Israel seemed incapable of being faithful and obedient in return. And among some a still more rigorous interpretation of their faith began to emerge. Surely God could not have intended that these many generations of struggle between God and the people should come to nothing. So the idea grew up that God would act, and would send a messenger, perhaps the return of the prophet Elijah who would come back on his chariot of fire. God’s messenger would appear and would finally secure God’s Kingdom. Much of the message will be familiar to readers of the prophets and the New Testament – what God demands is justice, honesty, fair payment as well as treating God and the Sabbath with honour and respect. It is also a harsh message, many will be judged unrighteous and will not be able to ‘abide the day of his coming’. But for a faithful remnant, God will establish a new kingdom of righteousness. And so the Old Testament ends with the promise of the return of Elijah and either repentance or total destruction. This is the message that John the Baptist picks up at the beginning of the New Testament with a message that is a good deal harsher than we will hear from Jesus. It is a promise in which many devout Jews still today trust as they hope for the coming of a Messiah. For Christians, the Messiah has come. Jesus is God’s messenger, God’s own Son. But his message has taken us all by surprise, for it is a message of forgiveness and hope not of punishment and revenge. It still takes us by surprise. Human beings all too often expect God to be angry and judgemental – like us – but as we see in Jesus, God’s messenger comes to us with the promise of a forgiving father.